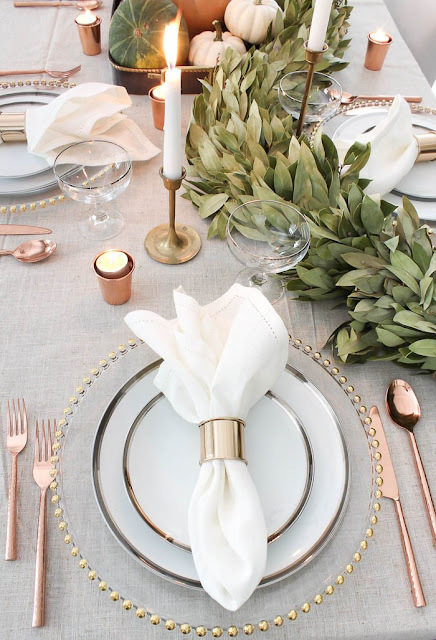 The use of copper, gold and silver against a cream linen backdrop creates a very elegant Thanksgiving tablescape. Bre Doucette of Rooms for Rent used both old and new pieces (her inherited china set with a few new things from All Modern). 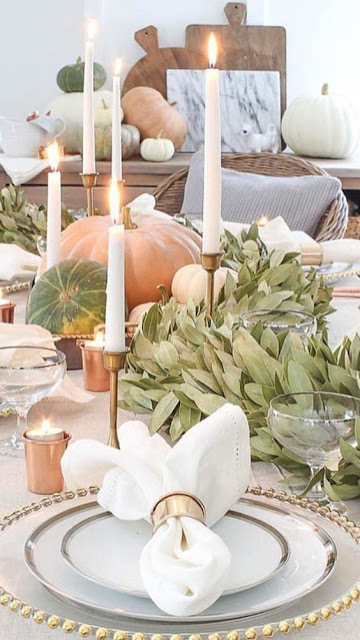 I love the way she draped a bay leaf garland across the table. 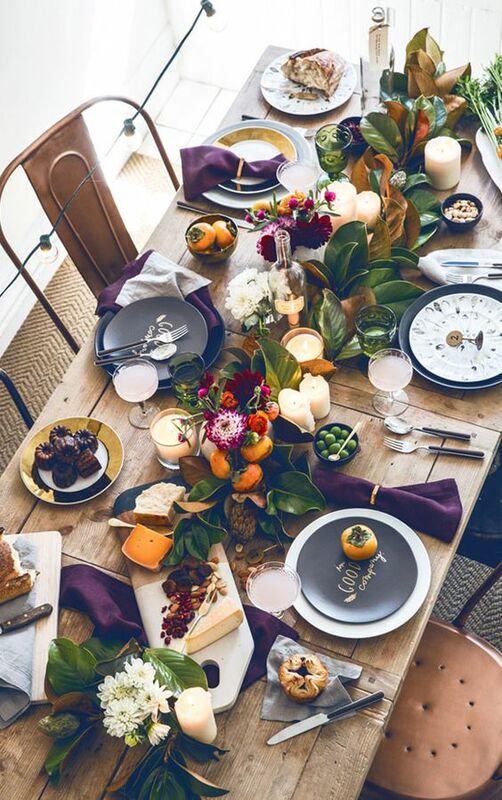 This table by Erin of Apartment 34 with mixed and matched different sets of china. Some of the dinner plates were white while others were gray. 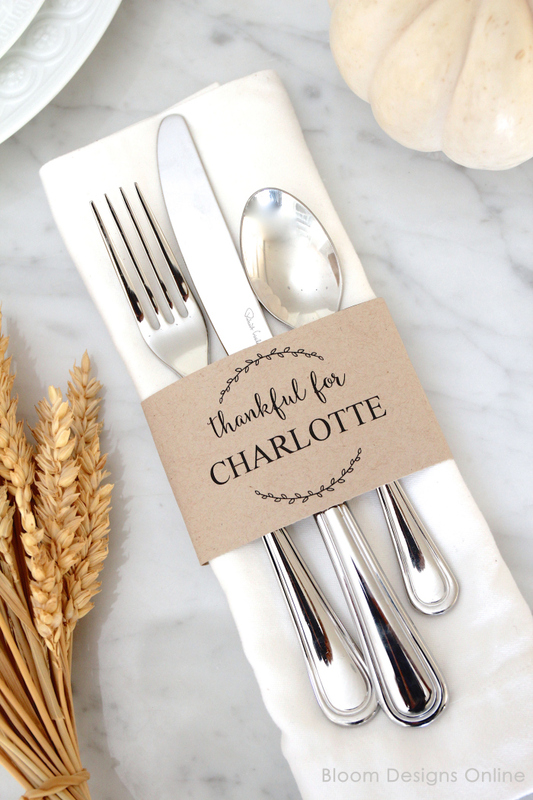 The napkins alternated between gray and a beautiful eggplant purple color. She used both crystal coupes and green glass goblets. As you can see, the table pulled together nicely. I love the fresh magnolia garland with persimmons still on the branch. This has a very relaxed and comfortable vibe to it. 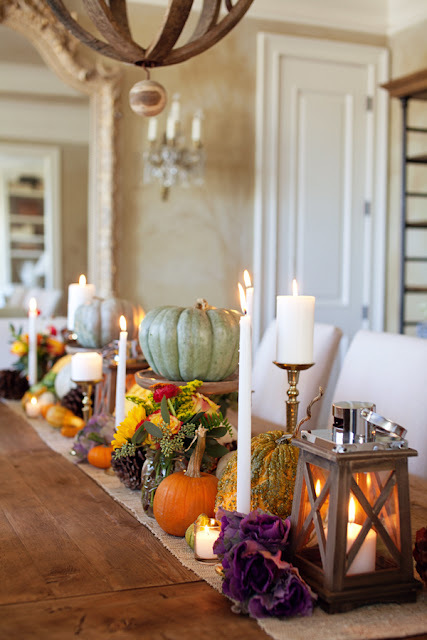 Layla Palmer of The Lettered Cottage has this beautiful step-by-step tutorial on creating this Thanksgiving centerpiece with pumpkins, pinecones, ornamental cabbage and kale, roses, sunflowers and lanterns. 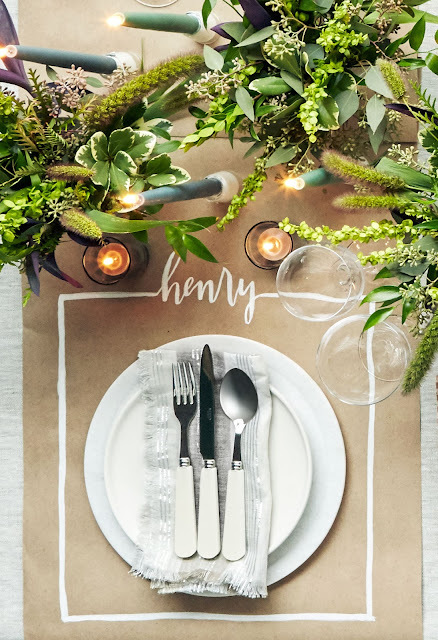 Country Living uses a marble charger, silver flecked napkins and kraft paper for each setting. 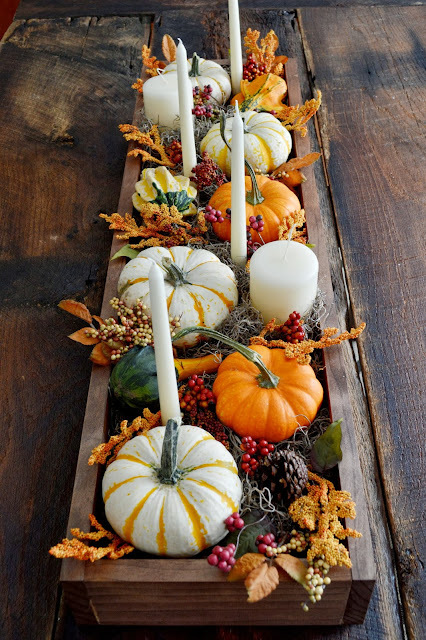 Tricia of 724 South House created this wooden box and shows how she created this fall centerpiece with pumpkins, spanish moss and candles. The following place settings are from Bloom Designs Online. Did I mention that this is a FREE download? Click here and scroll down to Tahnk. 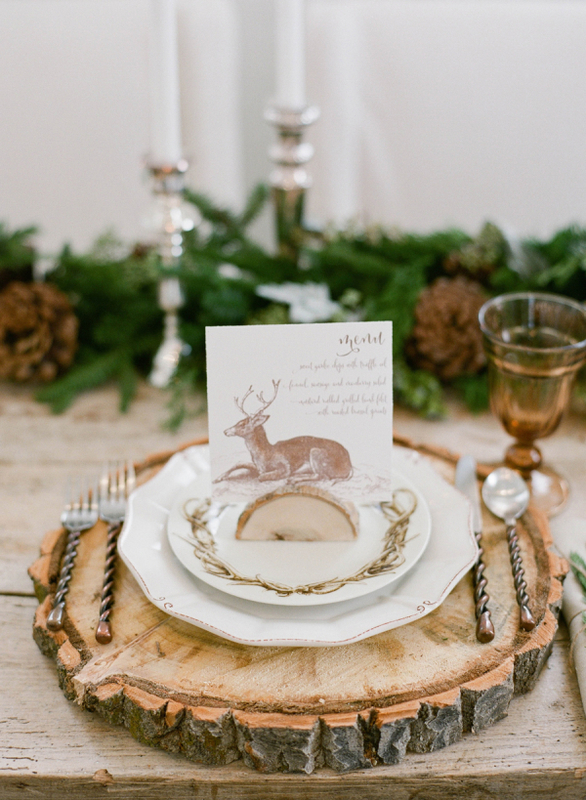 The next tablescape featured on Elizabeth Anne Designs was actually used for a rustic winter wedding inspiration. 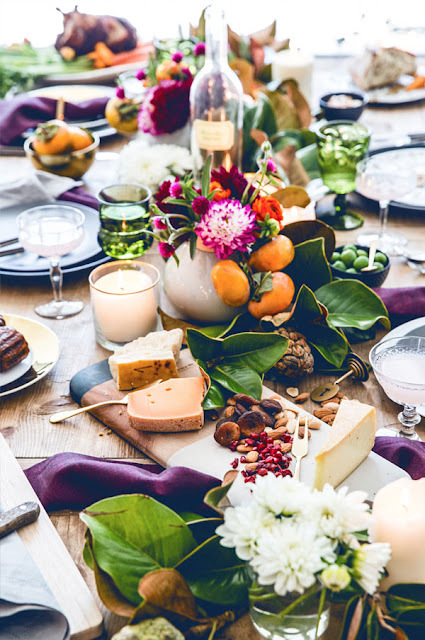 In my mind, I can see the use of different greenery (perhaps a magnolia or bay leaf garland along with some pumpkins) to make this tablescape less Christmasy. I adore the use of the wood stump charger.